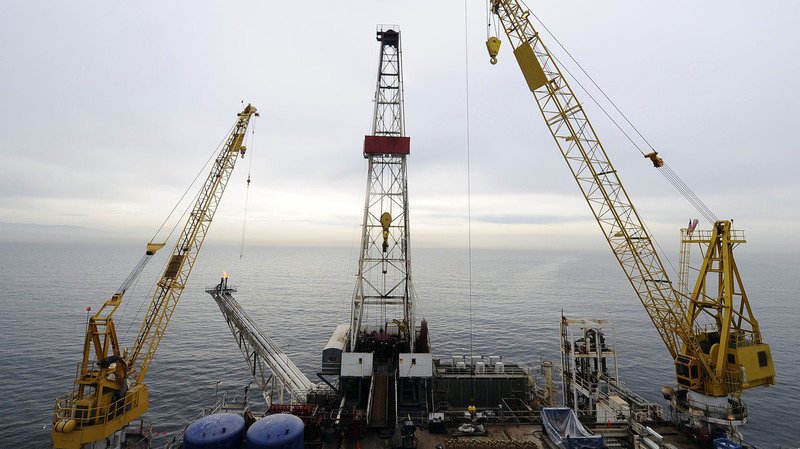 California May Have A Way To Block Trump's Offshore Drilling Push In the 1980s, California towns used local zoning rules to block offshore oil and gas drilling. State lawmakers are considering a similar strategy to push back against the Trump administration. The offshore oil drilling platform called Gail, operated by Venoco, Inc., off the coast of Santa Barbara, Calif., in 2009. More than a dozen states oppose the Trump administration's proposal to open up nearly the entire U.S. coastline to offshore oil leasing. Federal officials will get public feedback on the plan in Sacramento on Thursday. The Interior Department says it takes local concerns into account — as happened in a recent controversial move with Florida — but states have no direct say, since the leasing would take place in federally controlled waters. California thinks it may have found a way around. In fact, it's a strategy used the last time the West Coast was open for offshore oil drilling, in the 1980's, when President Reagan's Interior Secretary James Watt was leading the push. "We have enough energy to meet America's needs for thousands of years," said Watt at the time, "if we will have a government that will allow for its reasonable development." It was not welcome news for many coastal cities in California. 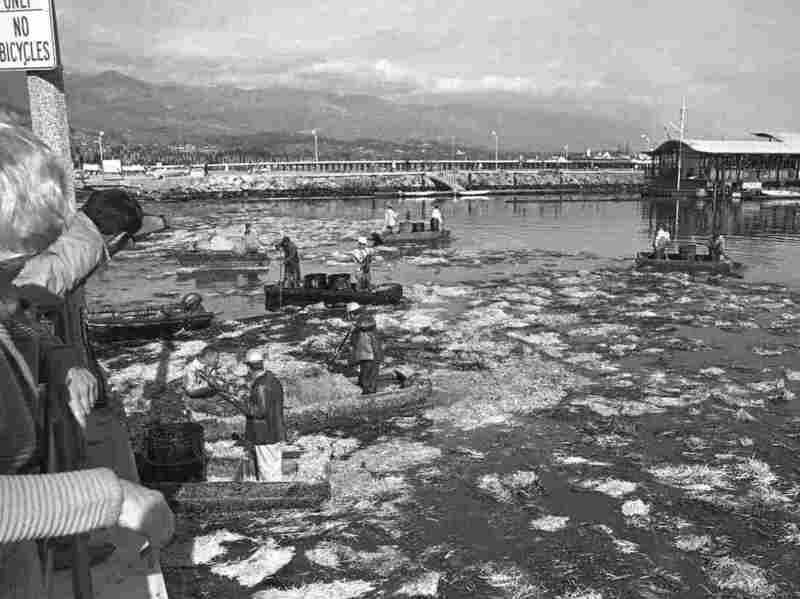 They were still spooked by a 1969 oil spill in Santa Barbara, in which some three million gallons of oil leaked from an offshore drilling operation and coated local beaches. "We had to respond in kind," recalls John Laird, who's now California's secretary of Natural Resources, but was then mayor of Santa Cruz, a small coastal city south of San Francisco. Laird called a meeting with drilling opponents and everyone agreed: their response had to have some teeth. "And I really struggled, thinking: teeth?" Laird says. "We're a city, and this is a federal government wanting to do this with the tacit approval of the state government." Then something occurred to him. When oil companies drill offshore, they still need to build infrastructure onshore, things like pipelines and helicopter pads. And it's cities who control the zoning and building permits that allow that, not the federal government. "A coastal wall of resistance"
Santa Cruz proposed a ballot measure that said if an oil company wanted to build facilities on land, residents would have to vote on it first. It passed. The measure also designated funds to spread the idea, so Santa Cruz hired Dan Haifley to be an anti-oil Johnny Appleseed. "I would sleep on couches and I would travel the state in my little car, tiny little thing," Haifley says. He visited local officials along the coast, slide projector in hand. "It was grassroots democracy and grassroots activism at its best," he says. Workmen in small boats gather oil-soaked hay from the water in Santa Barbara, Calif., on Feb. 8, 1969. Officials announced they had finally capped an underwater oil well which had been leaking oil into the ocean for 12 days, fouling harbors and beaches. In all, Haifley convinced 26 coastal cities and counties to adopt similar policies. They were challenged by the oil industry, but upheld by a federal court. Even today, oil companies can't build new infrastructure without voter approval in most of those places. The zoning rules create what Haifley calls "a coastal wall of resistance" against offshore drilling. But Would It Work Today? The idea has reemerged, now that the Trump administration is proposing a dramatic expansion of oil leasing. California legislators are considering a bill that would ban new oil pipelines and piers in state-controlled waters, which extend up to three miles offshore. California's lieutenant governor, who chairs the State Lands Commission, has also threatened to block any pipeline permits to transport oil. So, would that give an oil company pause? "Absolutely," says Bob Fryklund with IHS Markit, which does research and consulting for the oil industry. "The companies look at that. They look at the ease of operation." But California's policies may not work as well as they once did. Fryklund says technology has improved and now companies can get oil without having to build a pipeline to shore. Just they use floating oil rigs, known as FPSOs. "You have a giant ship that fills up full of oil and then goes off to a nearby port or refinery within that country or off somewhere else," he says. "That's pretty standard operations around the world." That method is more expensive. So, oil companies would have to be enticed by large oil reserves and high oil prices to make that worth it. Since many offshore areas in the Pacific and Atlantic haven't been surveyed for oil in decades, for now, the oil industry is waiting and seeing.